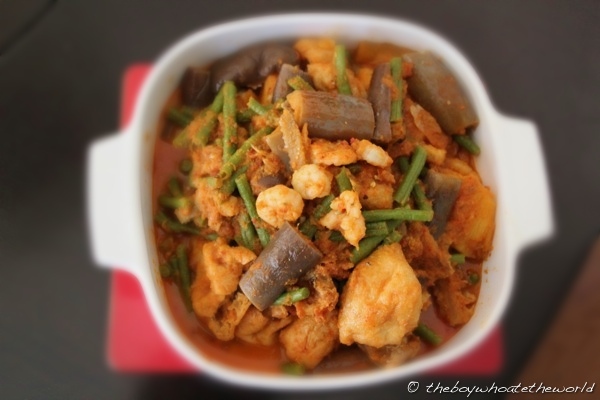 Kiam hu kut gulai (salted fish bone curry) has got to be one of my ultimate favourite Malaysian Nyonya curries. It has been one of our family meal staples for as long as I can remember and it’s a dish I always have without fail when I’m back home visiting. The combination of the fragrant lemongrass based chilli paste (rempah), sweet pineapple and savoury depth from the salted fish yields an incredibly complexed curry gravy that delivers layer after layer of dee-frickin-liciousness. This week, I finally convinced my godma to teach me how to make it. 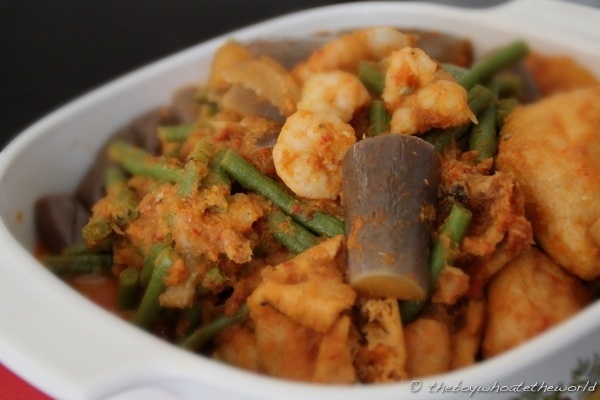 It’s customary to use prawns, french beans and aubergine as the main players in the curry, but feel free to use whatever additional condiments you fancy (I’d suggest sticking to condiments such as deep-fried beancurd that act as a blank canvas to soak up the wonderful gravy). I tend to avoid eating too much of the salted fish itself, using it only to impart flavour to the gravy as it’s high salt content can get a little bit OTT, especially when it’s not pre-soaked for enough time. However I know for some others, the salted fish is often regarded to be the best part. A must try if you love your Nyonya food. Enjoy! Wash the salted fish and bones thoroughly under running water, then soak in a large bowl of hot water for at least 15 minutes to remove any excess salt. Blend all the chilli-paste (‘rempah’) ingredients in a large food processor until it forms a fine paste. Add some water if the paste is initially too thick to blend. Heat up all the ground-nut oil in a large lidded pan and sauté the rempah on a medium-high heat for 12-15 minutes until fragrant, adding a tablespoon or 2 of water if it starts to dry. Drain away the water from the pre-soaked salt fish and bones, then add it into the pan to fry with the rempah for 2-3 minutes. Avoid mixing the fish too much so the meat stays intact (if it disintegrates too much into the curry gravy, the dish tends to get a little bit too salty). Add the pineapple chunks into the curry and cook for a further 2-3 minutes. Now, pour in about 2 cups of water to loosen the curry paste. You should get a gravy with a light-to-medium consistency in which you can cook off the vegetables. Throw in the french beans and aubergine chunks and cook on a high heat with the lid on for 8-10 minutes (or until the vegetables are done). Add some water if you feel the gravy is getting too dry. Finally, add in the prawns and dried bean curd. They should only need about 3 minutes of cooking at most. Once the prawns turn a rosy pink, turn off the heat and serve up!